Just purchase to minimum amount required to qualify for free delivery to save on shipping and receive your order at no extra cost. Where do I use my The Royal Mint voucher code? Choose the code you would like to use from Netvouchercodes, copy it and follow the link to The Royal Mint website. Find and add the products you wish to purchase to your basket. Visit the basket page by clicking ‘Your Basket’ at the top of the page. On the basket page below your delivery options, you will find the promotional code box. Enter your code here and click ‘Go’. When you purchase a collector’s coin or limited edition gift from the Royal Mint, you’re purchasing more than a beautifully made work in precious metal - you’re purchasing a little piece of history. With the Royal Mint promotion codes we offer, you can obtain an artfully crafted item of special memorabilia for a reduced cost, perfect for presentation at special occasions such as christenings, weddings and retirements, as well as celebrations of aspects of British culture and history, both modern and classic, such as coins commemorating Charles Dickens, Dr Who and Remembrance Day. When investing in bullion and precious metals, where better to place your confidence and trust than with The Royal Mint - the very place where the gold and silver Bullion coins are produced and one of the oldest organisations in the world. 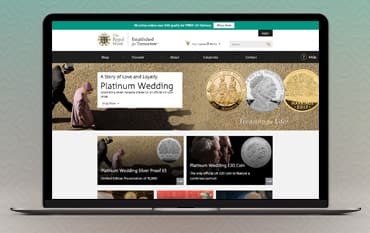 The Bullion range at Royal Mint offers both collectors and investors the chance to purchase gold and silver bullion products including coins, bars and Signature Gold. You can either choose to purchase the bullion products for storage in The Vault or for free home delivery within the UK. Coins are a brilliant way to commemorate an era. Find Jubilee coins from Royal Mint that do just that. Buy precious, attractive coins that you can collect and treasure forever and that will always remind you of the Jubilee. These are the perfect gift for a Royal enthusiast and must haves in any coin collectors arsenal. The new UK £1 coin from the Royal Mint entered circulation in 2017, with more than 1.4 billion new coins being produced. The new coins are being produced to make counterfeiting harder. The current £1 coin was first issued in 1983 and is one of the oldest British coins in circulation which is soon to become another worthy collectable left behind by the Royal Mint. For more Delivery Information, see here. If you wish to make a return, you must enclose your parcel with your Customer Code, your Despatch Reference Number along with your reason for return. This information can be found on the Depatch note. For more Rteurn info including the returns address, click here. Opened by the Queen in 1968, The Royal Mint is the world's leading export mint, making coins and medals for an average of 60 countries every year, its first priority being the production and distribution of coins and medals for Great Britain. The Royal mint commits to providing financial return to the UK Government, planning for organic growth and sustainable profits. At home it supplies the coins that underpin every day life, crucial to our daily transactions. It also manufactures and distributes coins to be treasured forever; collectables to commemorate deceased authors, Royalty, Wars and historic moments in British history. For a truly special gift, to be passed down through generations, that inspires a pride of Britain and family, visit The Royal Mint today.